All debris will set on the bottom. Rinse fern in cold water, cut back ends, put in saucepan, cover with boiling water, add a pinch of salt, and simmer for 5 minutes. Drain fern and transfer it to ice water to stop cooking process and give it a shock to retain green color. In a bowl mix aminos (or soy sauce), balsamic vinegar and Tamari soy sauce, add garlic, ginger, and fern. Mix well and set aside to marinate for 1-2 hours. When ready to serve, heat the skillet, add oil, saute zucchini sprinkled with dill and pepper until slightly golden (about 2 minutes). 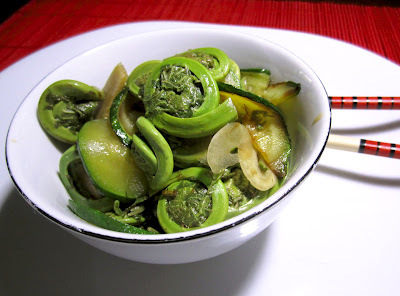 Add zucchini to fern, mix well again. Serve in a bowl with an Asian motif. Chewing, I closed my eyes and easily imagined myself sitting in a Japanese restaurant. Quite a pleasing experience. Tamari soy sauce contains some alcohol. You can use 1 tsp of vodka instead of it. If your fern fiddleheads are very small, boil 3 minutes, so that they are still bright green and a little crunchy.